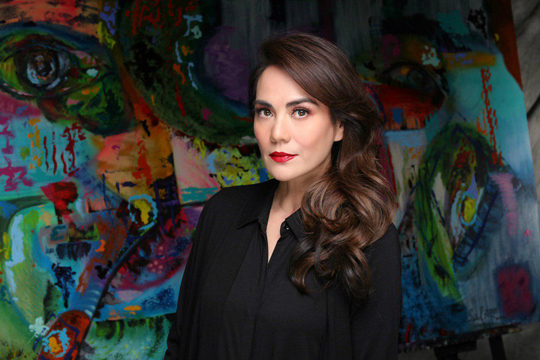 Painter Sal Ponce Enrile was selected to exhibit her works in the highly prestigious Artexpo New York, the world’s largest fine art trade show that will run from April 4–7, 2019. Sal was picked by the internationally-acclaimed art gallery, Agora Gallery New York, to become one of their featured artists in the expo, after seeing her abstract work entitled “Retrospect” which used acrylic, mixed media, and a variety of textures. “My curator for my first exhibit suggested that I should try submitting my portfolio to Agora Gallery in New York. I told myself I had nothing to lose and I did not really expect to be accepted,” she said. 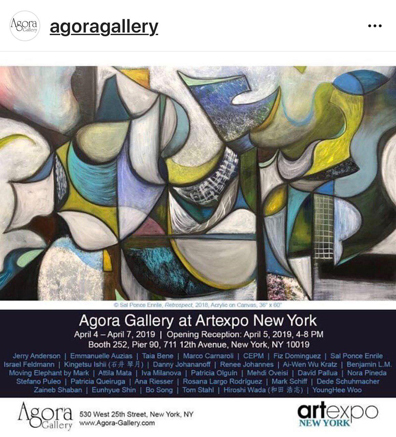 Through Agora, she realized another dream, which was to be able to participate in Artexpo New York. Her painting “Retrospect” was likewise chosen as the featured work for this year’s event invitation. Retrospect, just like her other paintings, are blurred out or grayed over like memories of a forgotten era. The brushstrokes look more like scribbles on a chalkboard, lightly hovering against a dark background. Retrospect showcases her work on controlled chaos, where an overall cohesive effect unites an array of bright colors and energetic brushstrokes. Aside from Retrospect, her four expressionist paintings – “Delirious,” “Dream,” “Perplexed” and “Glade” will also be displayed for thousands of art enthusiasts to see. Artexpo New York annually showcases over 400+ innovative exhibiting artists, galleries, and publishers from across the globe, displaying exciting original artwork, prints, paintings, drawings, sculpture, photography, ceramics, giclée, lithographs, and glassworks, among others. This year, the expo is hosting more than 35,000 avid art enthusiasts and qualified trade buyers—including gallery owners and managers, art dealers, interior designers, architects, corporate art buyers, and art and framing retailers. Throughout its four historic decades in contemporary and fine art, Artexpo New York has hosted the likes of Andy Warhol, Robert Rauschenberg, Keith Haring, and Leroy Neiman. “I think every artist’s dream is to be able to ultimately show their work in New York. After all, the careers of many of the top, well-known contemporary artists all began in New York City. Hence, I am truly grateful that I got this opportunity early on in my nascent career as an artist. I am humbled by this great honor as a Filipina to have my work displayed at the Artexpo,” Sal said. To view more of Sal’s work, you can follow her on Social Media via Facebook at www.fb.com/SalPonceEnrile/ and Instagram @salponceenrile.